Edwin Frank brings little known masters like Grossman and Platonov to light in English. Edwin Frank, the mind behind the NYRB classics series, grew up in Boulder, Colo. He graduated from Harvard University and studied art history at Columbia University. He is the author of two volumes of poetry. Frank has also become one of the most authoritative voices on Russian classics in translation and has been at the helm of the New York Review of Books classic series since its inception in 1999. The series has allowed Western readers to discover some works rescued from near oblivion. Nora FitzGerald: How did you get interested in Russian literature? 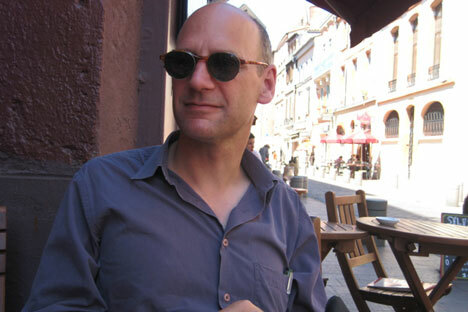 Edwin Frank: I became interested in Russian literature at a fairly young age. When I was a teenager, I became interested in Tolstoy, Dostoevsky, Gogol and Turgenev. EF: I guess a little bit…I got a sense early on that modern literature came from Russia. In college, I read Russian poetry, and widened my exposure to both prose and poetry. I was a little obsessive about it. Also, I went to college long enough ago that I could read what I wanted as well as what I had to. NF: When did you start the NYRB Classic Series? How has it evolved over the years? EF: It started out as a reprint series — though now we do a lot of originals, with a special emphasis on books that have never been fully translated into English. The first book in the series was a volume of Chekhov’s stories, then we did Turgenev’s “Virgin Spring,” and not long after we published our first book by Andrey Platonov, whom we continue to publish in wonderful translations by Robert Chandler. Years before a friend of my father’s who was a spy for the CIA had given me a book by Platonov, and as soon as I read it I knew this was an extraordinary writer. NF: Why do you think you have been successful with this venture? How do you measure success for NYRB classics? EF: With a series like this, you never spend heaps on anything and you hope that more successful books will pay for the less successful one, and every once in a while you get a windfall. For instance, Vasily Grossman’s “Life and Fate” which had been published in the U.S. as a dissident book and then, after 89, allowed to go out of print. We bought the rights to the novel, which may be the greatest single novel to come out of World War II by the way. The FSB just released the original manuscript of “Life and Fate” from its archives - Grossman always said the KGB had arrested his book--and this has put “Life and Fate” back in the news. NF: How many copies of “Life and Fate” have you sold? EF: It has sold in the tens of thousands. NF: Do you publish contemporary fiction? EF: Not first novels and such — we’re a classic series. However I am also interested in work by significant contemporary authors. We published two books by Vladimir Sorokin, “The Queue” and “Ice Trilogy." Sorokin has written some of the most powerful and uncompromising work to come out of Russia in the last quarter century. Recently his work overtly has taken on a more political tone.